This was a disappointing result for the Heanor faithful - but in all honesty it was a disappointing performance from the Lions and it could have been worse if the Prims' strikers had have had their shooting boots on. With Borrowash Victoria beating Ellistown, Heanor drop from top spot, and if they still hope to win the title they can't really afford to drop any more points from their final 5 games. Even then they will have to hope Vics slip up along the way. Heanor welcomed Tom Land to their ranks - the defender joined mid-week from Blackwell MW and went straight into the starting line-up, taking the left-back spot. Teams : Lions : West, J Foster, Land, Stevenson, Peel, Degirolamo, Webster, Royce, Benger, Vernon, Frost. Subs: Wells, Grayson, Slater, Littlewood, Hopkins. Prims: Toher, Robley, Milner, A Foster, Mycroft, Parker, Briggs, Williams, Fell, Slack, Oliver. Subs : Cooper-Richards, Fretwell, Shilcock, Freeman. No Kev today, he was away with his good lady, celebrating 28 years of wedded bliss! I took over 100 photos, but most of them were rubbish. Even though I captured the Benger goal, the pic was blurred... ﻿damn it! 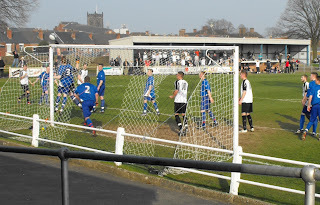 Heanor ought to have known that their visitors weren't going to be an easy touch - they had just won at Borrowash and it was the Prims had the first chance to open the scoring within seconds of the kick off. A neat cross from the left was allowed to go all the way across the home goal, and if Chris Briggs had shown more composure he may well have fired the ball past Neil West instead of missing his kick completely. 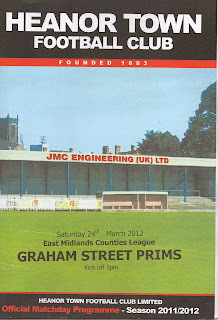 Heanor applied lots of pressure to the Prims back line, but lacked the usual cutting edge we have become used to. Vernon was given the nod over Grayson to partner Nathan Benger for this game, but for me, Grayson should have started, with Vernon a great impact player to be introduced after an hour or so, as happened at Blackwell last week. Told you they were blurred!!! All the strike did though was upset the Prims - and when they brought on Tom Cooper-Richards, it was one way traffic. 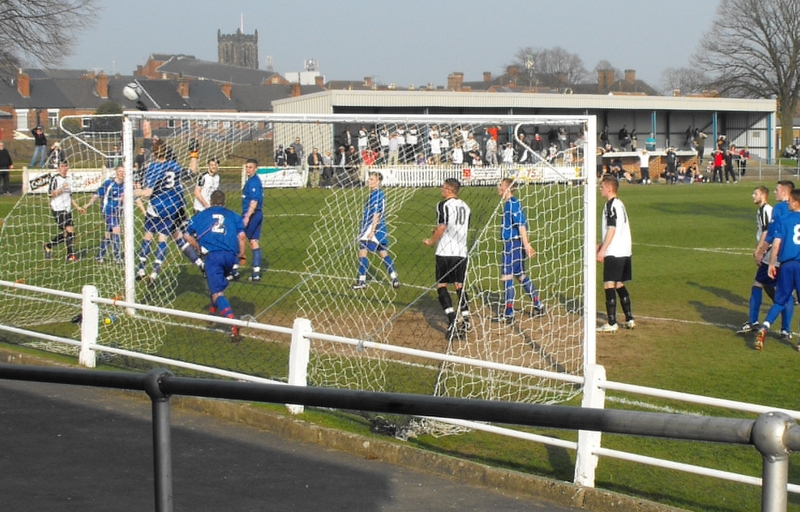 The sub was terrific, and he posed all sorts of problems for the Heanor back line - and it was his shot on 74 that was blocked by West, but the ball went straight to the feet of LEE FELL, who hammered the ball into the back of the net. Not a very comprehensive, detailed report, but there was hardly anything of note worth writing about. It will be interesting to see Mr. Stan "Heanor Town" Wilton's take on the game later.